John Constantine, Deadman, Shade, Zatanna, Xanadu, and rest of DC's supernatural superhero squad are getting their own animated feature. According to The Hollywood Reporter, a rating from the British Board of Film Classification heavily suggests Justice League Dark is getting a direct-to-home video release. This rating is for a special feature on Batman: The Killing Joke that has a running time of 7 minutes and 50 seconds, suggesting we're getting a pretty in-depth look at the making of Justice League Dark. Justice League Dark is comprised of less conventional DC Comics heroes, and often deals with more ethereal and supernatural threats. While the Super Friends are duking it out with the likes of Darkseid, Justice League Dark is in the shadows, sealing away malevolent spirits. 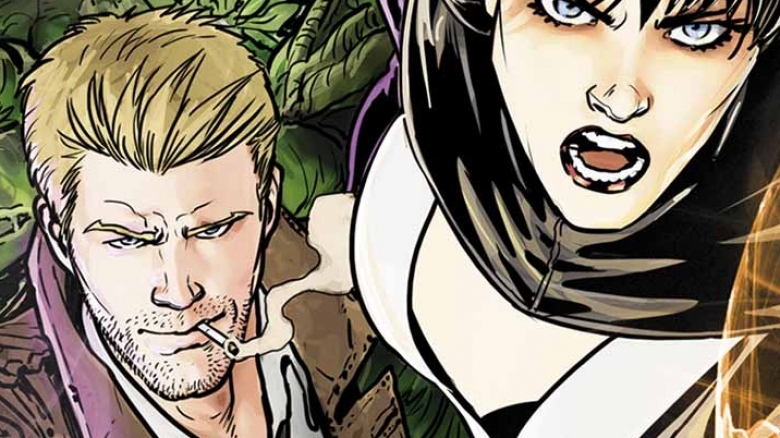 The group's roster includes characters like Constantine, Madame Xanadu, Zatanna, Swamp Thing, Andrew Bennett, Doctor Mist, Frankenstein, Deadman, and Zauriel. This is a huge change from the project's beginnings, which originally had director Guillermo del Toro at the helm. Of course, del Toro's name has been attached to numerous movie projects that ended up stuck in developmental limbo for years (At the Mountains of Madness, Hellboy 3, Pacific Rim 2), so it's interesting to see Justice League Dark move forward as an animated feature. We hate to dig up the past, but NBC's Constantine series (featuring Matt Ryan as the titular hero) was canceled after its first season due to poor ratings. Perhaps DC is testing the waters for interest in the noir group before aiming for a live-action film? Here's hoping Swamp Thing can make a long-overdue proper return to the spotlight. The next DC animated feature heading to home video is Batman: The Killing Joke, which hits Blu-ray and DVD August 2, 2016, with a digital release scheduled for July 23.